The accuracy and precision that OHAUS Water Analysis Meters is known for has now been translated into the world of water testing. 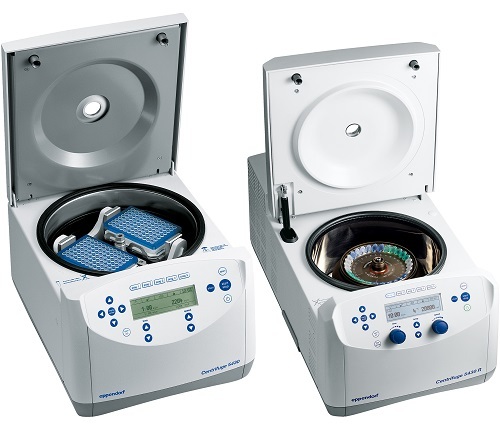 OHAUS Water Analysis Meters are designed to analyze and test water samples, based on the perfected art of measurement OHAUS achieved through their long-standing line of weighing instruments. OHAUS Water Analysis Meters are durable, practical and affordable. Starter Water Analysis Pen Meters provide the freedom of movement along with the durability and water resistance to ensure users can determine accurate results even in rugged environments. Water testing requires a high level of accuracy and in the field, it requires high versatility and speed. The OHAUS Starter 400D Portable Dissolved Oxygen Meter marries these concepts together to make field work easier, more comfortable, and more efficient. Calibration is quick and easy to reduce the time from turning on the device to measuring. The device automatically compensates for pressure and temperature and allows the user to compensate for salinity. Users can recall calibration and measurement data from the 30-item. 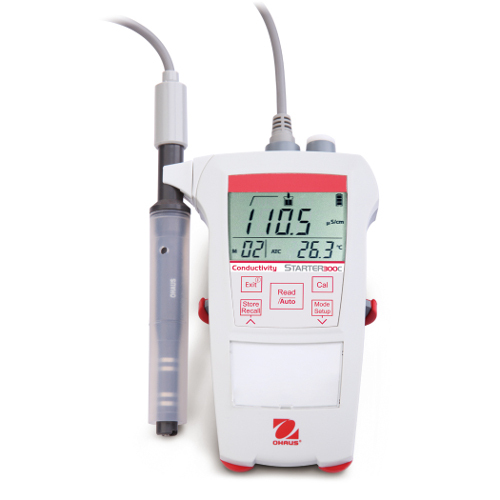 The Starter 400D Portable Dissolved Oxygen Meter uses optical technology to make readings faster. The luminescent probe avoids frequent membrane replacements and can start working immediately on start-up. The OHAUS Starter 300C Portable Conductivity Meter is designed to be comfortable and portable. The Starter 300C is equipped with a 4-pole linear electrode for advanced measurements removed from pollution and polarization. Units feature a 30-item library so that users can quickly access the most recent calibration data and up to 30 recent measurements. The OHAUS Starter 300 Portable pH Meter is designed to make field pH testing comfortable, fast, accurate, and easy. The automatic buffer recognition and stored calibration data makes preparation fast and avoids calibration errors. The meter is then immediately ready to use after calibration. Furthermore, the meter will even compensate measurements to adjust for temperature, with the built-in temperature sensor. 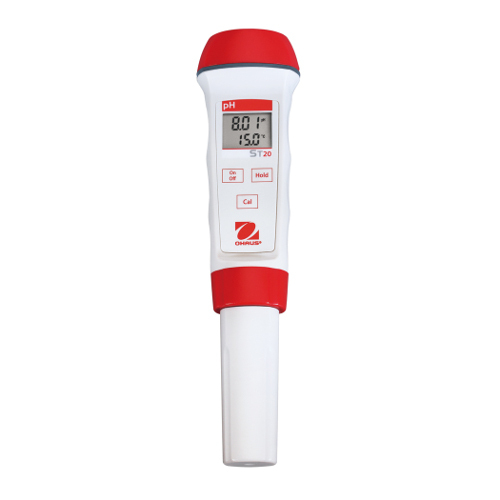 Users can also choose to manually adjust the temperature coefficient. Recognized for accuracy and precision, OHAUS applied their advanced measurement technology to water testing and creating the Starter 300D Dissolved Oxygen Portable Meter. It features intuitive operation, clearly labeled navigation, multiple measurement display, and the durability to perform field or lab work. 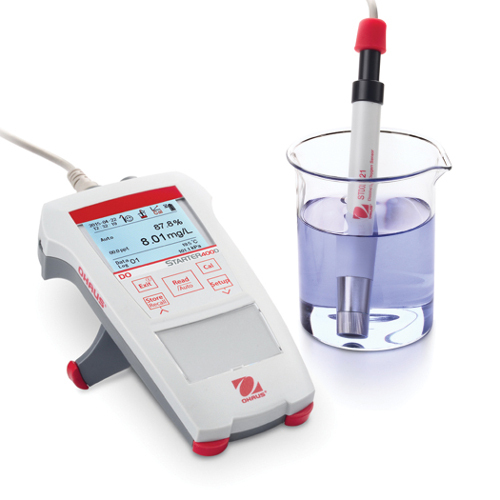 The OHAUS Starter 300D Dissolved Oxygen Meter is designed to comfortably fit in users’ palms and be able to quickly and reliably collect measurements. It allows users to track calibration, so they can make sure past and present results are precise and repeatable. The LCD screen clearly presents data and can be easily interpreted for user convenience. The Starter 300D Dissolved Oxygen Portable Water Analysis Meter combines OHAUS’ renown measurement technology with the portability and convenience of a handheld device – the perfect tool for scientists that need to work in rugged environments but still want accurate, fast results.